At the first opening, n-Track shows the Start your song menu. 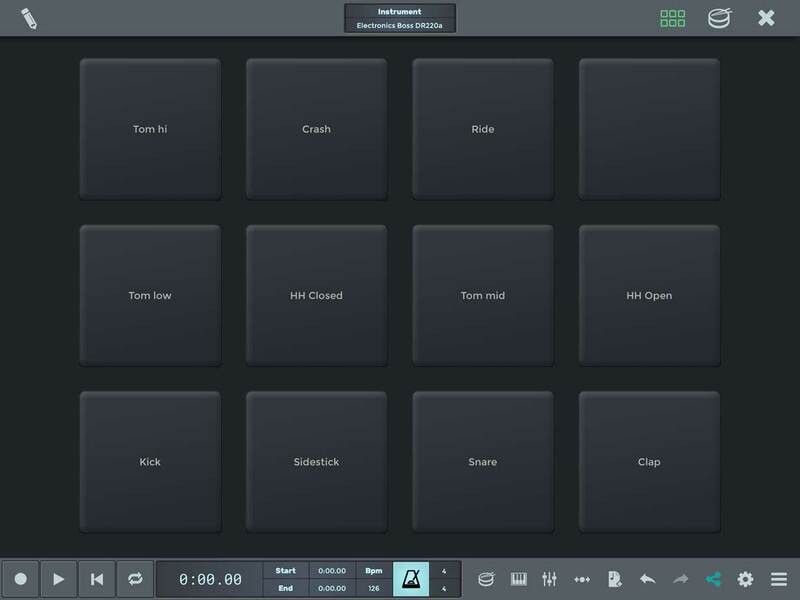 Here you can choose among different templates that let you start your song quickly and easily. To start your song from scratch, without using a template, just close the menu. The transport toolbar contains the transport control to navigate the song, play, start recording and using the playback loop function. Starts recording on the currently armed track(s). Sets the timeline cursor to zero. During play, restars playback from the project's start. If active, loops playback of the timeline selection. To using it you need to highlight a part by drawing with your fingers on the timeline axis, activate the loop functions and tap the play button to listen to the highlighted timeline selection. For more info about how using the loop timeline axis, please see our video tutorials. The main toolbar is a scrollable area that contains the most important functions of n-Track Studio. This is your control panel. Here you’ll find all you need to compose your songs. To save your project or open a new one, change settings, export midi or mixing down your song, import audio and midi files. .
Share online: Uploads your song to the Songtree music collaboration community, and lets you share it via a link. You can optionally let others discover your song and collaborate on it. * These features require an n-Track subscription or the Pro version of the app. Re-performs the last action you cancelled via undo. 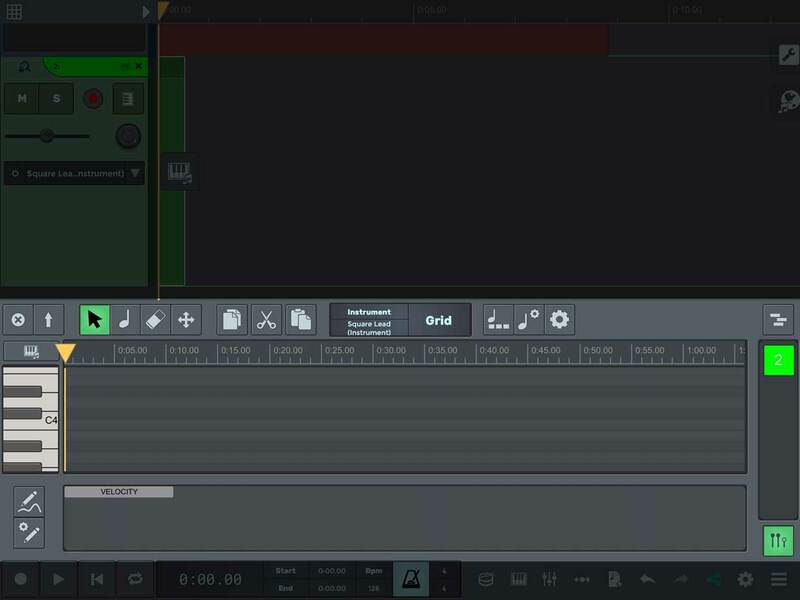 Lets you add a blank audio, midi, instrument or step sequencer track. View or hide the mixer, where you can control levels, pan, effects and routing of each track in your project. Opens the screen midi keyboard to start play your virtual instruments. Opens the screen drum controller to play drums and percussional virtual instruments with your fingers. The track bar contains the control commands of a specific track, like mute, solo, arm button, monitor live input button, pan, channel output, and channel insert effect panel. Locks the track zoom at the dimension you set before enabling this function. Lets you choose the track's input and enables/disables it for recording. Lets you listen to the incoming signal through the selected output destination. Note: make sure you have headphones or your output volume is sufficiently low to avoid feedback. Sets the track's level. This is the same as moving the track's mixer slider. Sets the channel’s pan position (L/R positioning in the stereo field). Sets the channel’s output. Can be the master channel, an Aux or group channel or another track. Displays the active insert effects for the selected channel. To add an effect simpy tap on it to open the effect browser. By tapping on "start" or "end" you can choose among different view and monitor your selection start, lenght or end. You can edit a part via the waveform editing widgets. Tap and drag the top stripe on a part to move in up and down the timeline. Tap and drag vertically to set the part’s gain level. Tap and drag to fade in or out the part’s volume. 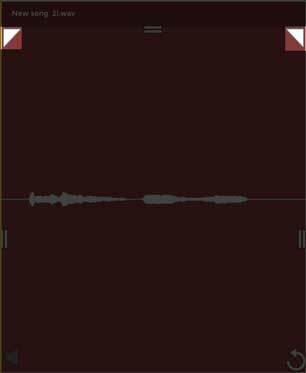 Dragging will shorten or lengthen the audio or midi part. Lengthening the part to more than it’s full size will loop the part. Drag to loop the part. Copy the part to the clipboard. Cuts the part and copies it to the clipboard. Pplit the part using the time axis bar or slice the current selection into a new part. Lets you send the selected part to other devices or apps. Copies the selected part into the clipboard. Pastes a part from the clipboard. Minimizes the channel height, or expands it back to its previous height. Once enabled, dragging will let you stretch the part while persevering the audio's pitch. Opens the part properties and the transpose part tool. The grid icon shows or hides the grid. By enabling the grid you'll be able to choose among different grid parameters (Measure, Beat, Eight, Sixteenth, 32nd, 64nd, 128th). Enable snap to grid: If this option is checked, the selection and the parts offsets (when dragging with your finger) will snap to the nearest grid line. In some cases, showing or hiding different kinds of tracks could be useful. You can set which track type will be visible or hidden on the timeline by tapping the select tracks to view icon . Let’s say we want to record an audio track. First of all, what we need to do is tap the add a blank track icon , then choose “add an audio track” to add a new, blank audio track. Before starting to record, we need to check the audio track is “armed”. This means it has an input channel assigned and is enabled for recording. To arm a track, tap on the arm icon . 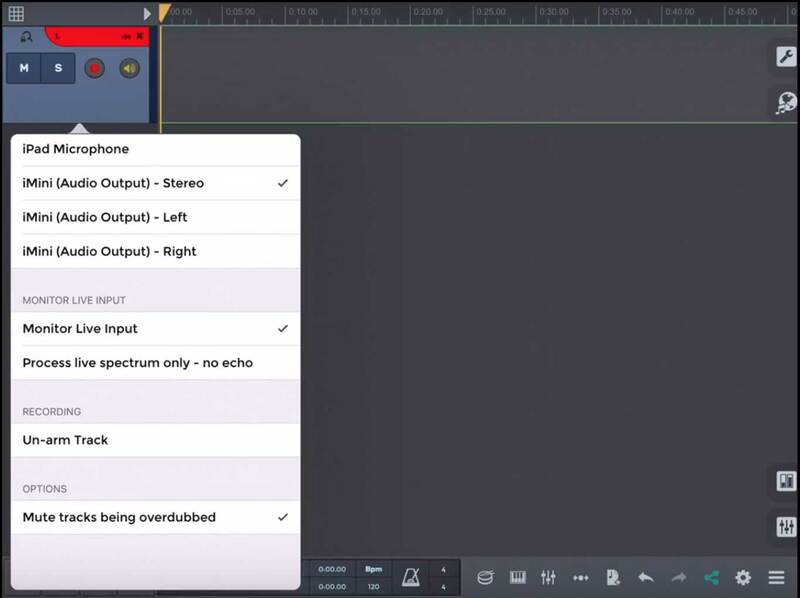 Here you can choose the input channel from which n-Track should record sound. If the project is blank, you can automatically start recording by pressing the record button on the transport bar. This action adds a blank armed audio track and starts recording from your built-in microphone. n-Track will normally record from the device builtin microphone, from the headset mic (if a headset is connected), from an external mic or from an USB device connected via the Camera Connection Kit. At this point, simply pick up your instrument and push the record button to start recording your first audio track. To stop the recording, simply tap the record button again. Now tap the rewind button or move the yellow timeline cursor to the position you want to start playback and push the play button to listen your creation. If you want to focus on a section, and listen to a single part of your take repeatedly, then you need to use the Loop timeline selection. To use it, you need to highlight an area by drawing with your fingers on the timeline axis, activate the loop function and tap the play button. n-Track will now restart playback from the beginning of our selection as soon as the cursor reaches its end. Reading the manual is too boring? 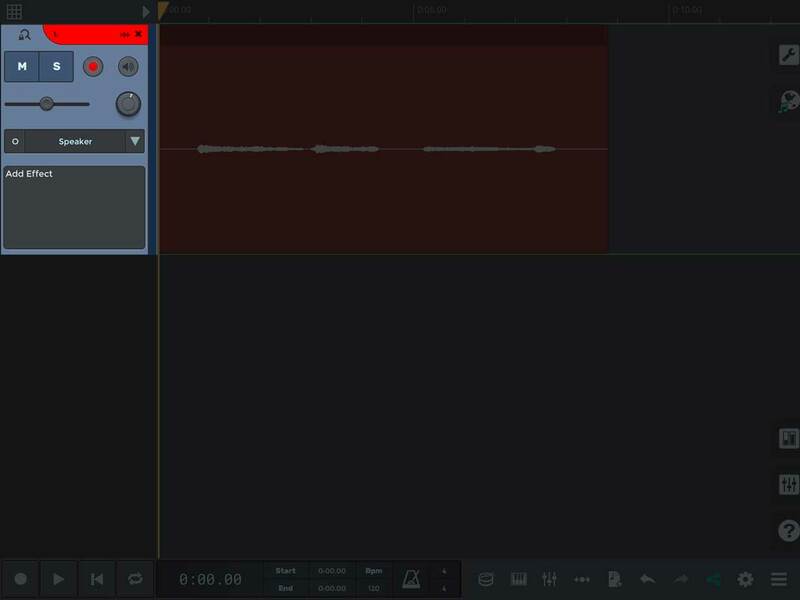 Watch a Video tutorial on how to record your first audio track. Let’s say we want to record something over the first track. All we need is to add a new blank audio track and arm it, then we can start recording. So, again, tap the Add a blank track icon and choose "Add an audio track”. If the track is not armed, tap over the arm button and select the right input channel. 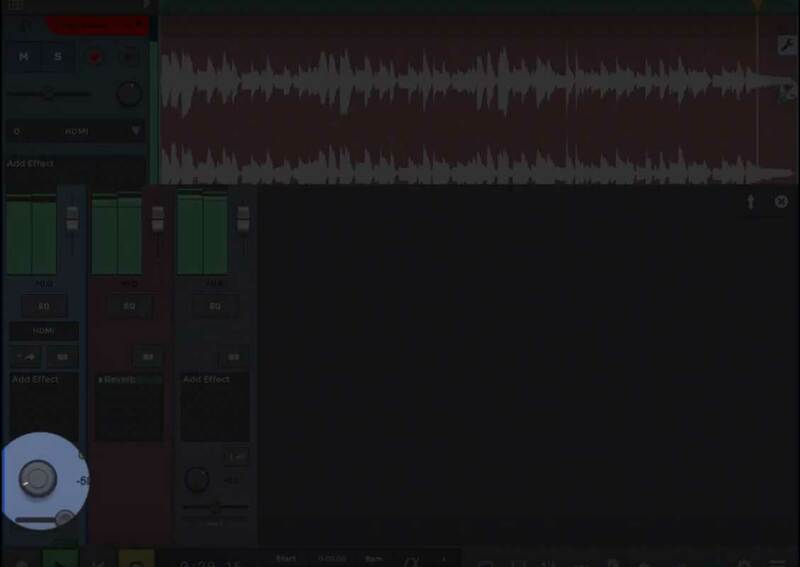 Since you want to record a second track over the first audio track, you need to be able to hear the first and the second track together during recording, but you want only the second track to be recorded, so make sure the first track is unarmed. To listen to what you’re recording as you play it, you can tap the Monitor live input button , which will let you listen to the incoming signal through the selected output destination. Make sure you plug in your headphones and then push the “Monitor live input” button to start listening to the incoming signal. You can now record as you hear what your mike is capturing. Let’s say you want to upload a base track, backing track or instrumental, and then record your voice or instrument over it. All you need to do is tap the Menu icon and select “Import audio file”, then select the file you want to import into n-Track. n-Track will create a new audio track with the imported audio file, so we can now record over it. To record something over the imported track, just add and arm a second audio track, then start recording. If we’re satisfied with our performance, but we want enhance or get creative with the sound, we can add an effect. Let’s say we want to add a reverb to a vocal recording. Just use your fingers to zoom into the time-axis view, until you see the add effect panel. 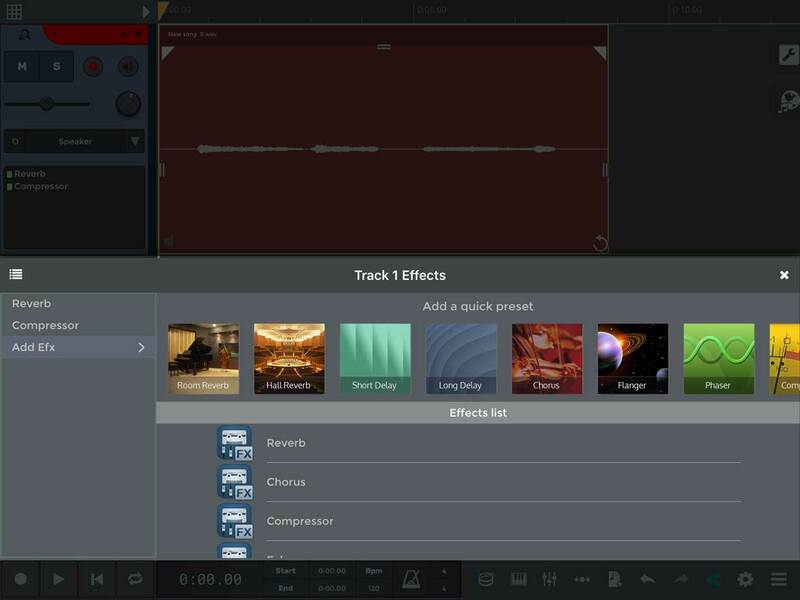 Click on “add effect” and choose among the free integrated effects available in n-Track Studio. It’s a common use to record songs by following a click track or metronome, and then use the grid to align our recordings to the song’s tempo. You can select the bpm of your song by tapping the Metronome icon and selecting the bpm you need. To activate the metronome, switch it on with by tapping the power icon . You’ll now hear the metronome both during playback and recording. To turn it off, just open the metronome and switch it back off. 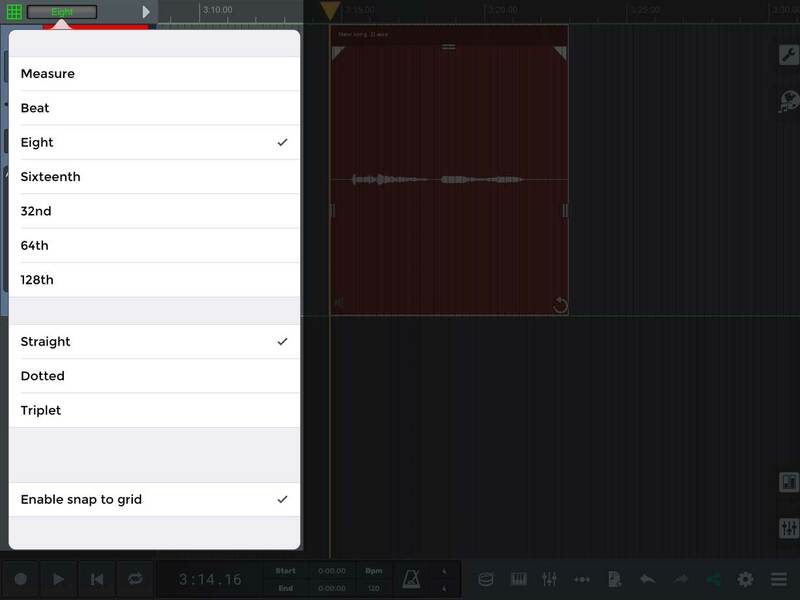 The grid function can be useful during editing, and in general when you need a reliable tempo reference while working on your song. You can enable the grid by tapping on the “grid icon” . You can set the grid time resolution by tapping the grid settings window (see the picture below). As you can see there’s also a "Enable snap to grid" checkbox. If this is enabled, when we move audio and MIDI regions their start position will be quantized to the closest grid value. This can be useful if we’re creating more electronic or loop based music. If you uncheck this box, but leave the grid on, then you’ll be free to move regions in any point of the timeline, and still use the grid as a useful tempo reference. To add a new virtual instrument, just push the “Add a blank track” button and select “Add an instrument”. 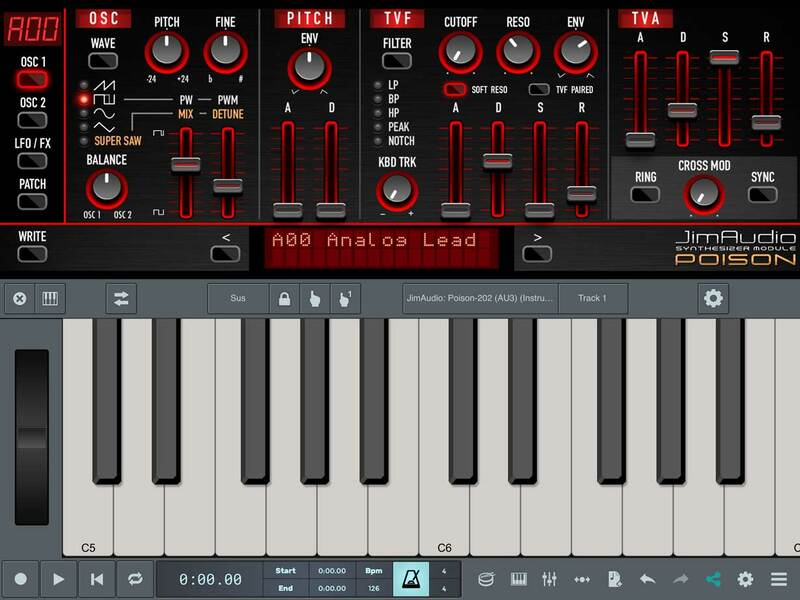 This will create a MIDI track and an Instrument track automatically assigned to the MIDI track created. MIDI tracks will contain the sequence of MIDI notes, as well as other MIDI parameters, such as velocity. Instrument channels, instead, are where the actual audio from the MIDI notes is generated. 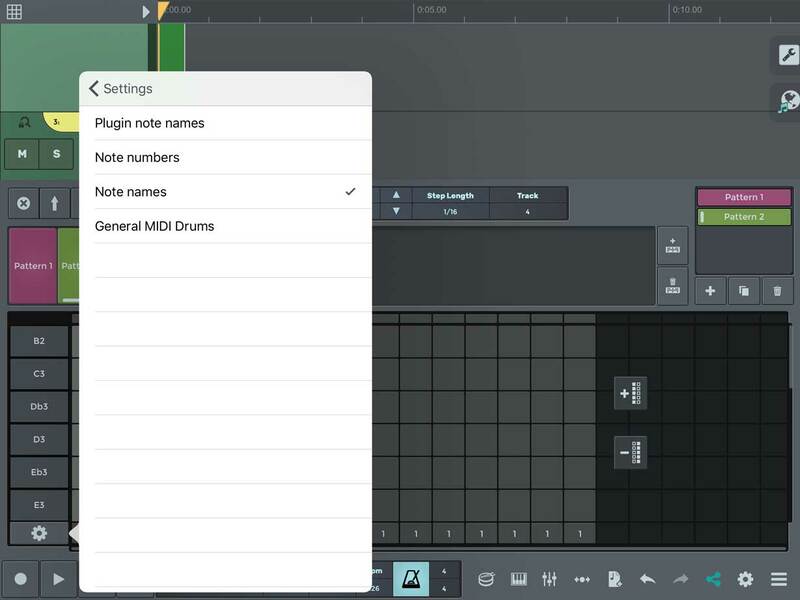 Multiple MIDI tracks can send their output to a single instrument channel. The creation of a MIDI track will open up the instrument browser, that lets you choose the virtual instrument you want to control via MIDI. To change the MIDI track instrument, simply tap the track’s output slot. To immediately control our virtual instrument, tap the keyboard icon and start playing it with your fingers, or open the piano roll by tapping the icon. and start writing midi notes via the piano roll's tools. 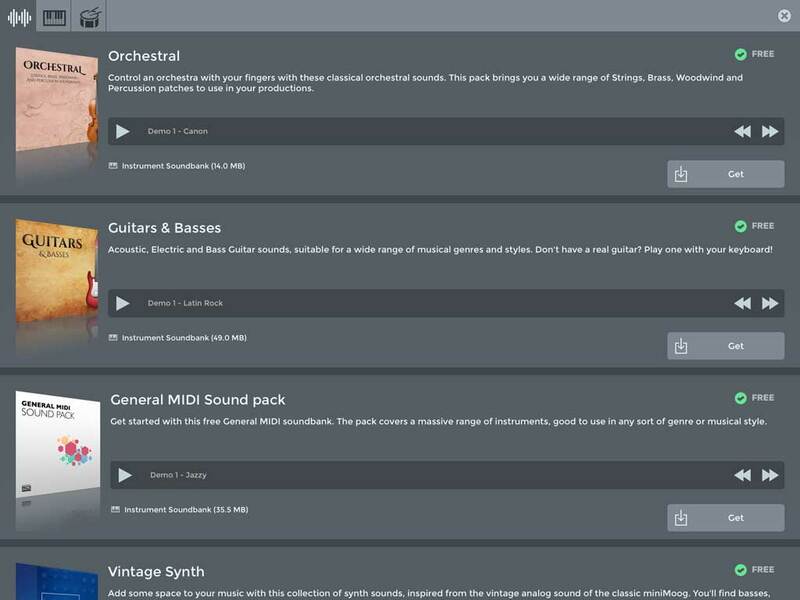 The instrument browser lets you choose the instrument you want to play via MIDI. 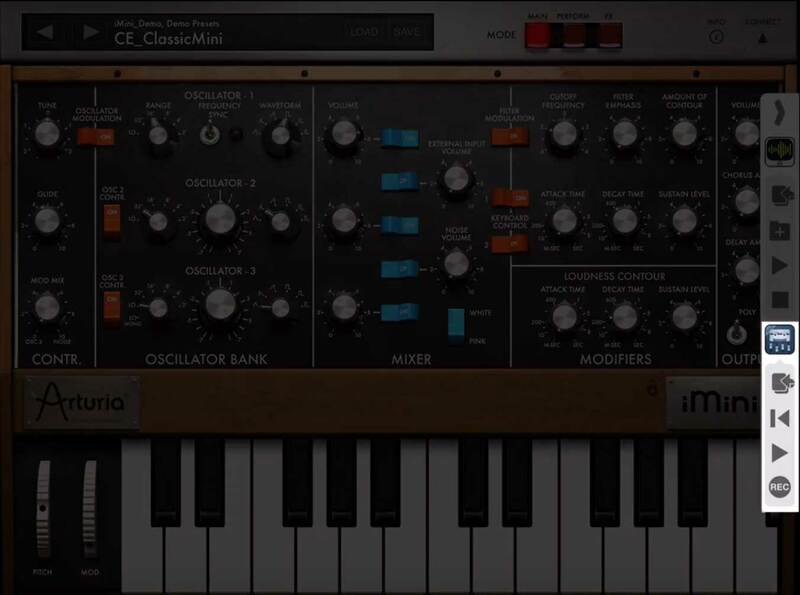 It will popup when creating instrument tracks, or when you tap on a MIDI track’s output slot, so you can easily choose a new instrument or switch the sound on an already created instrument track. External instruments: Here you’ll find all supported third-party virtual instrument plugins available on your system. n-Track instruments: In this section, you’ll find a list of n-Track’s built-in instruments. Instruments and patches which show the download icon require an additional download, which you can launch via the Add-on manager. 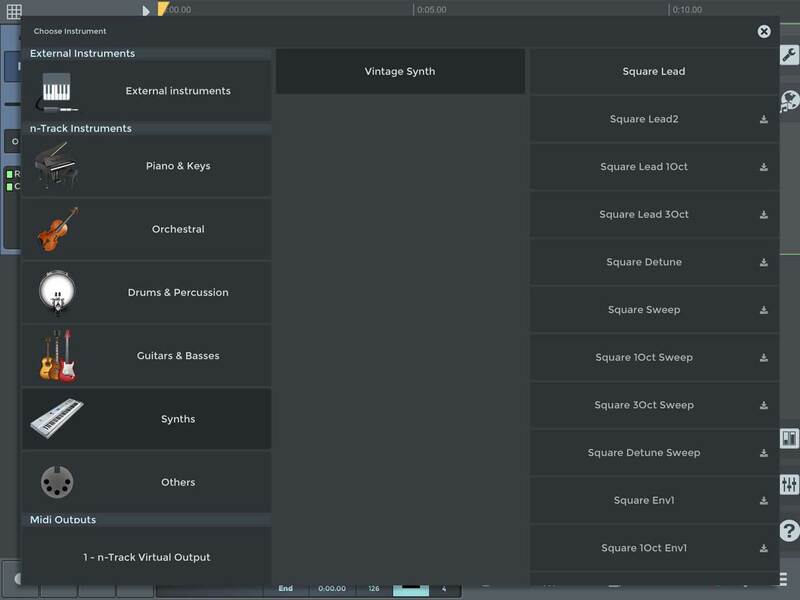 MIDI outputs: shows the available hardware MIDI outputs, as well as already created instrument channels which you can send MIDI to, allowing you to route a new MIDI track to an instrument you already created. 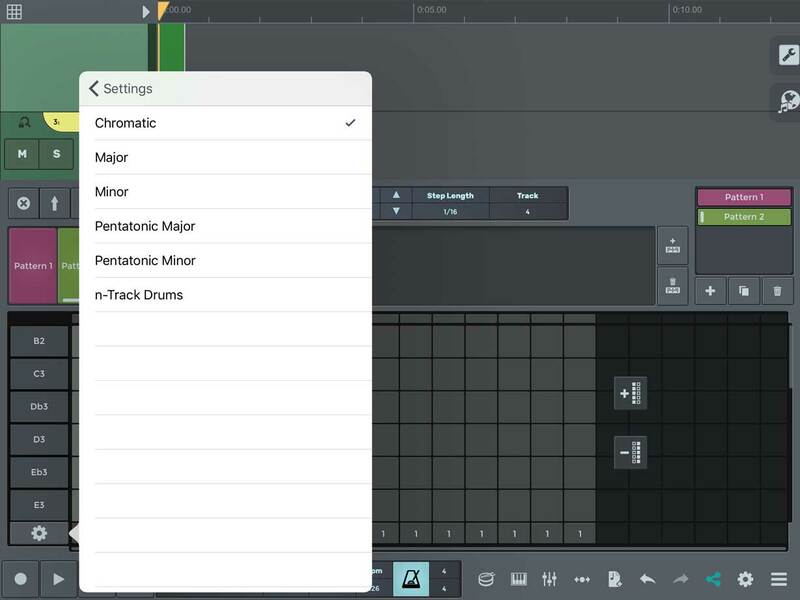 When you select an instrument from the instrument browser, n-Track will create a new instrument channel with the instrument loaded up, and assign it to a MIDI track. If this is the first time you open the instrument browser, you may need to download additional instrument packs in order to have more choice than the few built-in sounds. Selecting the sound will bring up the Add-on manager, where we can download content. The Add-on manager lets you download free and premium instruments, sounds and drumkits available for use in n-Track. 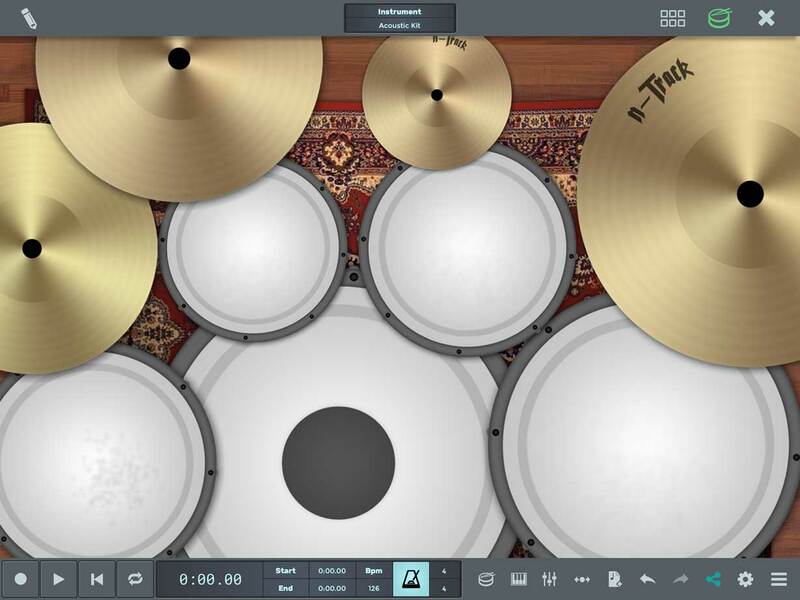 Here you can download free and premium instruments, sounds and drumkits available for use in n-Track, which will be automatically once downloaded. To download a sound, just tap on “Get". The sounds will then be downloaded and automatically installed. Once installed, you'll be able to play and record the instrument, and load it directly from the instrument browser. Saving a project means your project and all of its settings will be saved in a format you can open exclusively in n-Track (the .sng format). To save a project, just push the Menu icon and select “Save song”. You can then re-open your project at any time by selecting the “open song” option. If you want to save all the project’s settings and all of the project’s files and assets, you can choose to save the project as a “compressed Song” (sgw) file. Saving all project assets together with the project would allow you, for instance, to open the project with all of its audio tracks in a different device running n-Track Studio. Exporting, or ‘mixing down’ a track means that all the tracks of your project will be bounced down to a single audio file, in the format you specify, like mp3, wav, and so on. Once mixed down, your song will be playable anywhere, but please note that exporting track, as well as other features, are not available in the free version. To export songs, you need to either pay for an n-Track subscription, or activate the full version, both of which you can do directly from the app. Although you can’t export to audio files, remember that in the free version you can freely upload the track to Songtree app, the free music collaboration platform, and then share it via a link. To export your track, tap the “menu” icon and select “mixdown”, then choose the format and the bit rate, then press “ok”. 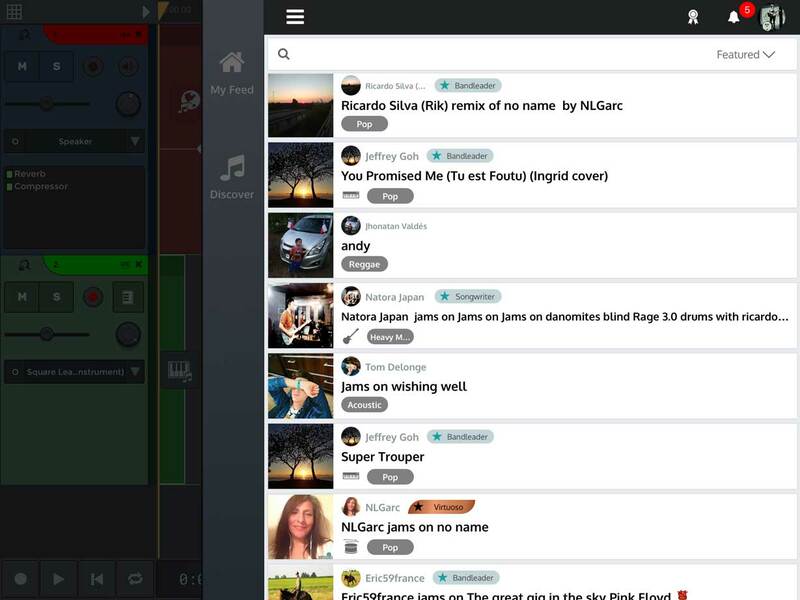 Songtree is a free music collaboration platform that allows to collaborate with other musicians in building songs online. Songtree is developed by the same team behind n-Track. When someone uploads a song to Songtree, it becomes available for others to contribute to and build upon. 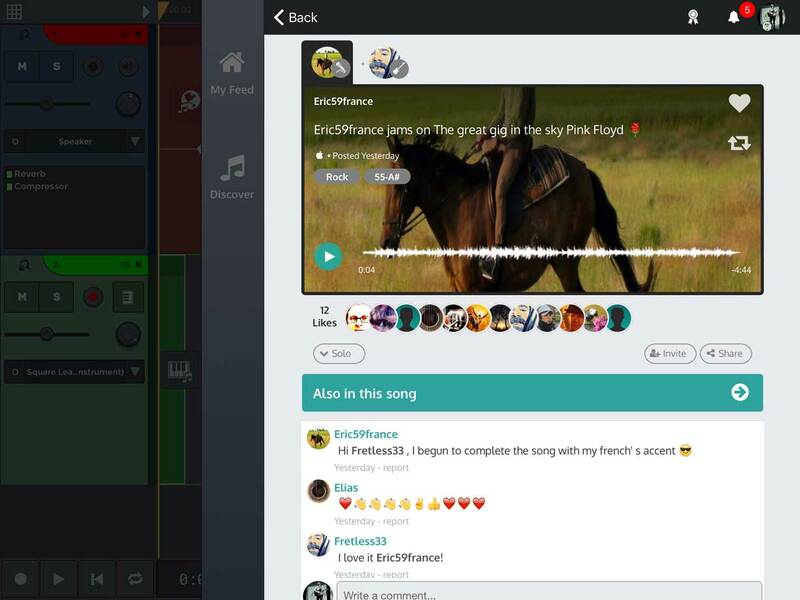 Each contribution added by users creates a new version of the song, while the original song remains un-affected. As more people add their contribution, a 'tree' of songs starts to take shape, with each contribution branching out from the original song. Songtree is available as free web, iOS and Android apps. The apps allow you to record your performances directly from your device, as well as letting you interact with other musicians via comments, likes, invites etc. Songtree is fully integrated inside n-Track Studio 8, so that you can overdub other Songtree users songs without leaving n-Track. On Songtree you can find other musicians to collaborate with, share ideas, or just jam with. To open Songtree just tap the “globe” icon. Then click on the top left icon and select “login” to access your account or create a new one. You can also sign in with Facebook or Google and gain instant access. We invite you to take a look at what’s happening on Songtree, you may be surprised! 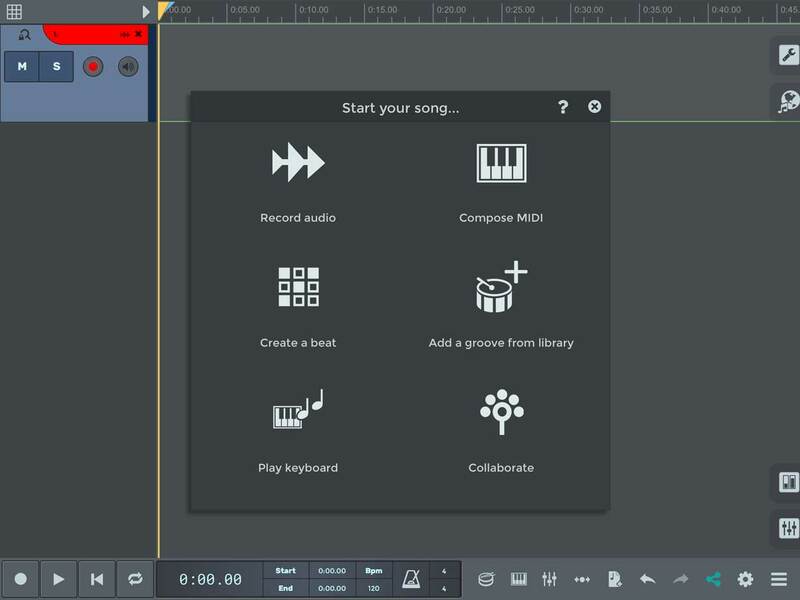 In previous chapters, we saw how to add and arm an audio track, how to record instruments or vocals, and how to upload a base track, or backing track, and record over it. We also talked about editing parts and adding effects. In the following sections we’ll give you some tips to obtain a better sound from your recordings because in fact, although we’re working on a mobile app, all we need is minimal extra hardware and a little extra knowledge to make our recordings sound clear and professional. As far as specific models go, you can choose among many different solutions in many different price ranges to fit your specific budget and needs. To connect your external sound card, just plug it to your device using the interface’s connector cable. 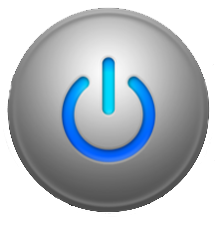 Once plugged in, n-Track will detect your device automatically. You’re now ready to record. Just make sure that the recording input is set to the soundcard input you wish to record. You can do this via the arm button, as we saw in previous lessons. If your soundcard hasn't been automatically recognized by n-Track Studio, please use this form and let us know. 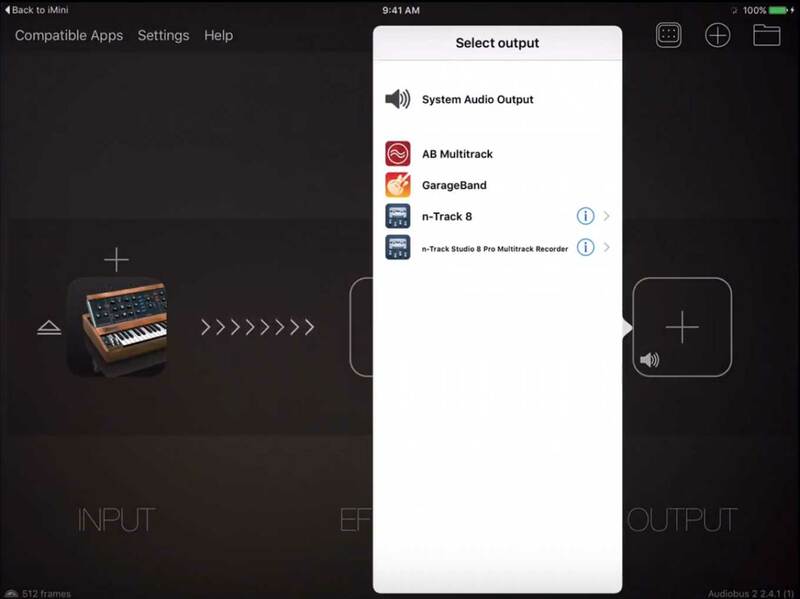 n-Track supports Apple Inter-app audio system, available on iOS 7 and later. 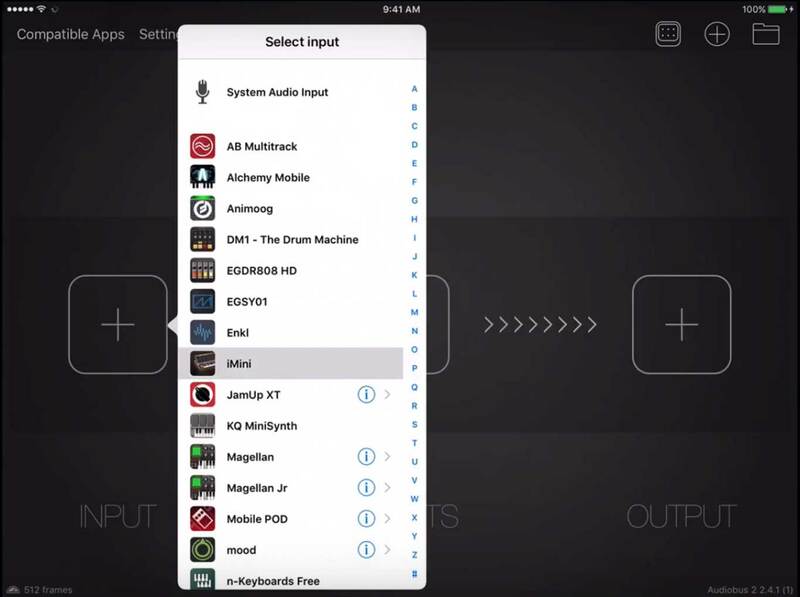 Like Audiobus Inter-app audio allows using 3rd party apps as plug-ins to generate or process audio. 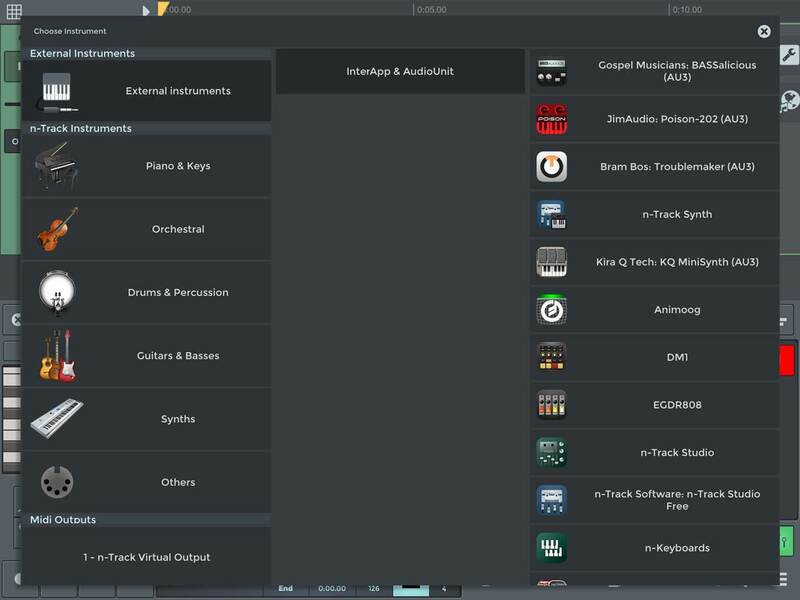 n-Track Studio 3.1 allows using inter-app instrument and generator apps, that will act as audio sources and MIDI synths, generating audio which is then received and further processed inside n-Track. 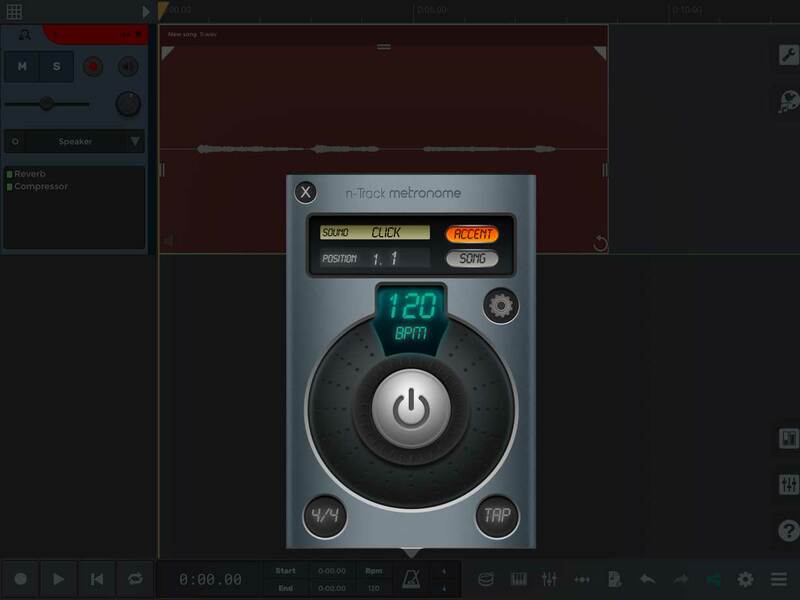 When using an inter-app instrument, note that unlike with Audiobus you don't have to record the output of the instrument to a track, you can simply keep it as an instrument, which will receive MIDI notes from n-Track and convert them to an audio signal. 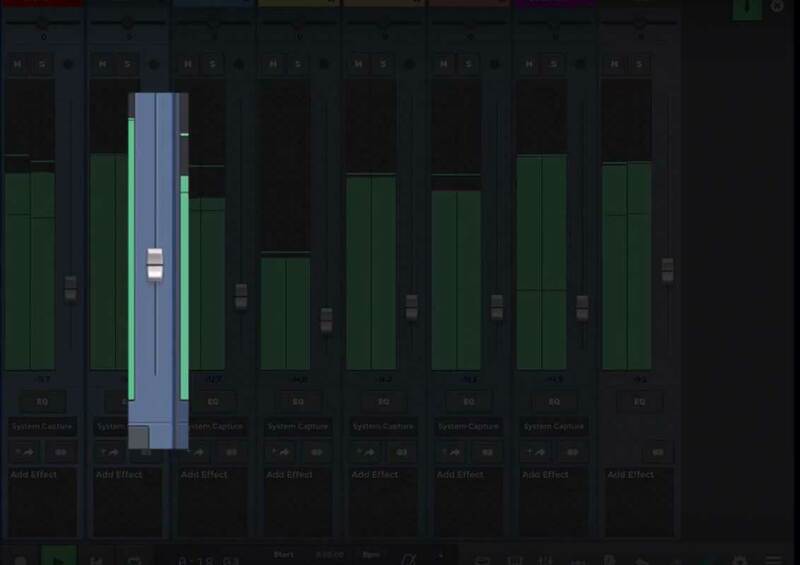 When you're finished working on the song you can just mixdown the song and the audio from the inter-app instrument will automatically be included in the mixdown. n-Track Studio 3.2 and later also allows using inter-app effects, you can just a 3rd party app as an effect to any track, group, instrument or master channel. Version 3.2 also allows using n-Track as a plug-in inter-app inside 3rd party host apps, n-Track can act as instrument, generator and effect. In some scenarios, you may wish to control a track’s routing options, meaning the input and especially the output destination of the track’s signal. This may be useful when, for instance, you want to group various tracks together to control their overall level or eq. Or, you may wish to record the output of various tracks into a new audio track, or perhaps send the signal from various tracks to an effect. You can control each track’s input/o utput settings via the mixer. This is where you can decide to route a track to another. For example, apply a send effect. 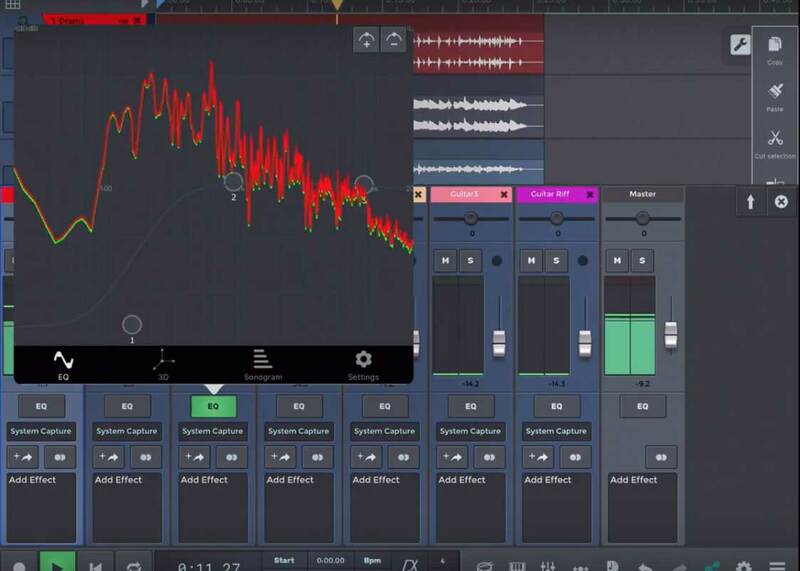 Send effects, as opposed to insert effects - which affect the entirety of the track’s signal - allow you, for instance, to have a single reverb effect and send different amounts of your tracks to it. For example, let’s apply a reverb to an audio track, first as an insert effect, then as a send effect. To apply a reverb as an insert effect, all you need to do is pick the effect from the track’s effects panel. 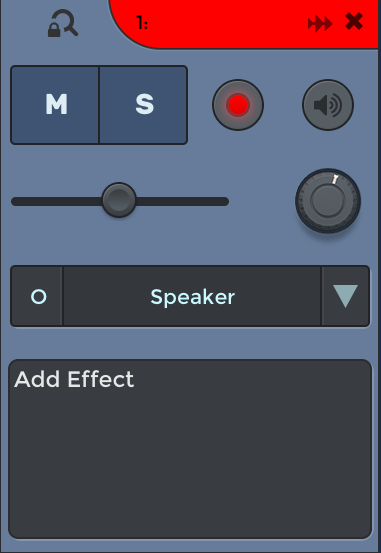 This will let you choose an effect to apply, which will affect the entire signal (or better, the amount set by the dry and wet parameters) before passing it to the output. You can also add effects using sends. A send allows you to send a track’s signal to an auxiliary track, which will be the host of the insert effect. This allows you to send different tracks to the same effect in different amounts, controlled by the send amount knob. To add a send effect, open the mixer. Then tap the add effect button or tap this little window and choose "add new send". As you can see, a new Aux track was automatically added to your project. Now all we need to do is add an effect on Auxiliary track. To do this, just tap the "add effect" panel of the Aux track and choose an effect. We’ll give the reverb 100% wet and 0% dry signal, since the dry component will be coming from our original track, and the auxiliary track will only provide the signal with the effect applied. We can now control the reverb amount using track one’s send knob. When you mix a song, you’re usually looking to make every element in your song be heard clearly and fit well with the other elements, both as far as level and frequency content are concerned. You can control each track’s level via the mixer sliders. For instance, if our bass is too quiet compared to the drums and guitars we could bring up it’s level. First of all open the mixer view and tap the EQ icon of the channel we want to modify, then start modify frequencies. We might then choose to apply a high pass filter to the guitar to carve out room for the bass frequencies to stand out without interference from other low-end frequencies coming from the guitar, resulting in a clearer mix, in which we can actually hear all the individual elements more clearly. Previously, we had a look at how to add a virtual instrument track, how to download virtual instruments for free and how to record midi tracks. The objective of these following lessons is to bring you to next level of using MIDI for creating your music with n-Track Studio. In the previous lessons we learnt how to set up our virtual instruments. 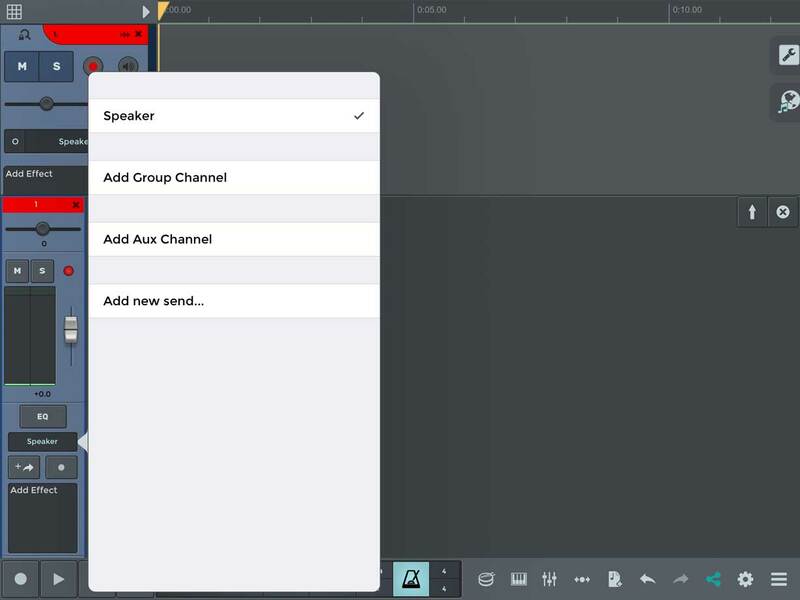 This time we’ll look at how to actually play or program these instruments, whether by connecting controllers or by using the program’s built-in tools and editors. Once you’ve added a new blank midi track and selected an instrument from the instrument browser, then you need to play it. n-Track lest you do this in various differents ways. One way is using the built-in virtual keyboard, that you can play immediately, via touch gestures on your device. To open the virtual keyboard, just tap the “keyboard” icon on the track bar and start playing. Lets you expand the keyboard view or duplicate it and playing with two keyboard. Lets you scroll the keyboard octaves.. Tap this icon while playing notes to sustain them. Locks the sustain virtual pedal. Holds the last note played. Opens the screen keyboard settings. Another built-in controller is the drumkit controller. Some drum or percussive virtual instruments loaded from the instrument browser will call up this kind of controller, more appropriate for playing these kind of sounds. To open the drum controller, simply tap the “drums icon” . You can now play the kit’s elements by using your fingers. You should notice that in this "acoustic" view, some kit elements trigger different sounds depending on the area you hit. There is also a more "electronic" layout, which features drum ‘pads’, similar to those you would find on a hardware controller or drum machine. To change the instrument we’re controlling, simply tap the instrument name on the top center of the screen. A great tool to write midi sequences or create rhythms is the step sequencer. The step sequencer lets you compose rhythms and songs using smaller pieces - called patterns - as the building blocks for more complex scores. To open the step sequencer, click “add blank track” , and then “add step sequencer track”. We can see the step seq in full screen by clicking this icon Now, write your sequence, and then hit play. We can add or remove steps from our sequence with the "add step" button or "delete step" button . In freerun mode the currently displayed pattern will be played indefinitely in loop. This mode is useful for testing ideas, practicing, jamming and live performing. 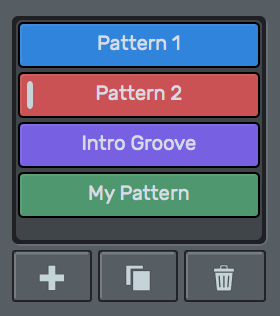 In playlist mode you can assemble a customized sequence of patterns. This is especially useful for composing songs with different sections (eg: verses, choruses, fills). You can switch between the two modes at any moment, using the mode selector. The pattern roster contains all the available patterns for the track, you can think of it as a toolbox filled with rhythms ready to be used. After creating several patterns in the roster, you can switch among them clicking on the desired one. If the song is playing, you will immediately hear the new pattern right after selecting it. To add notes to the currently selected pattern, tap on a cell in the pattern’s note grid. The cell will light up and the corresponding note will play when the progress cursor crosses it. The note for the cell’s row is indicated in the note list, on the left side of the grid. Tap on the note’s button and drag vertically to modify its velocity. The button’s light will dim reflecting the velocity level. Switch to playlist mode: from now on, patterns in the roster will not be played when you create or select one of them. Only patterns added to the playlist will play in sequence. To add a pattern to the playlist, click on the button while the desired pattern is selected, or drag the desired pattern from the roster to the playlist. You can arrange the patterns’ ordering in the playlist at any moment, dragging them where desired. When playback is activated, the playlist will be reproduced, following the main song time position. To remove a pattern from the playlist, select it and click the button. The removed pattern will still be available in the roster for reuse. Shows the pattern’s name. Click on the name to modify it. Shows the number of time steps for the selected pattern. Click on the arrows to change it. Indicates the time distance between each step, and the base duration of each step (the duration can be modified for each step independently, see [Notes duration]. The length is expressed in musical notation. Indicates the track you are working on. Click to select a different track. Indicates the play speed in BPM. This is a global setting (not specific to the pattern), mirroring the one in the main toolbar. A pattern with 16 steps of 1/8 duration each will last the same as a 32-step pattern with 1/16 long steps. If you want more control on the position in times of the notes, try selecting a smaller step length. To permanently delete a pattern, click on the button while the pattern is selected. When a pattern is removed from the roster, it will be permanently removed from the playlist as well, if present there. Clicking on the button, the currently selected pattern is copied and a new identical pattern is added to the roster. This is useful to start working on a new pattern that is a variation of a previous one. The modifications performed on the new pattern will not affect the original one. By default, each note has the same length as the time separation between note-on events. If you need a note to be played for a longer or shorter time, modify the duration value in the note duration row. Making a note longer than the step length easily allows for overlapping notes arpeggios. Each pattern’s note grid can have a customized number of rows, each one representing a pitch value. To add or remove rows from the pitch list, click on the buttons. You can transpose the note list - and thus the pattern - clicking on the buttons, and you can even set a custom note for each row, clicking on the button and selecting the note from the resulting menu. From the same menu you can select one of the alternate namings available for the note list. You can also load specific scales in the midi list, to ease the composition process. Just click on the scale button, and select a major, minor or other type of scale in the desired key from the menu. Click on Advanced to fully control all aspects of the scale generation. To change the color of a pattern, right-click on it in the roster and select the desired color from the Color sub-menu. 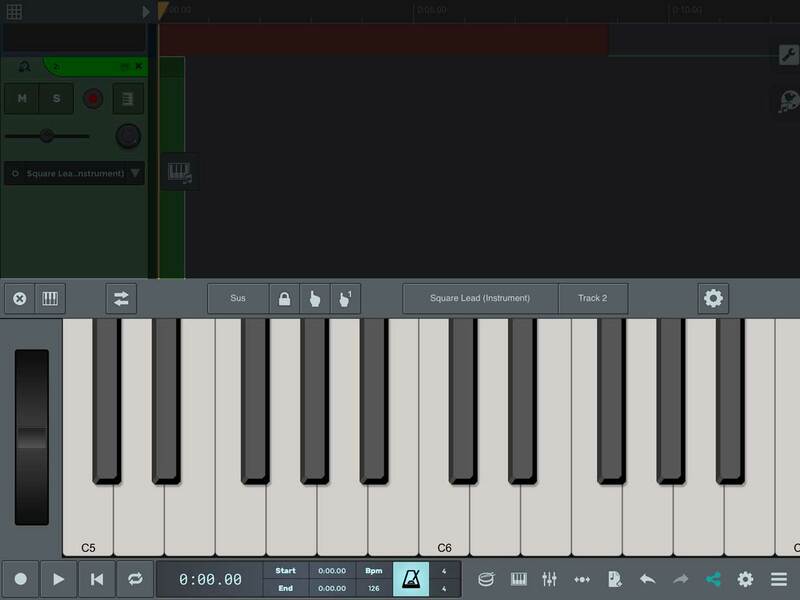 You can also use the piano-roll to write your MIDI parts. 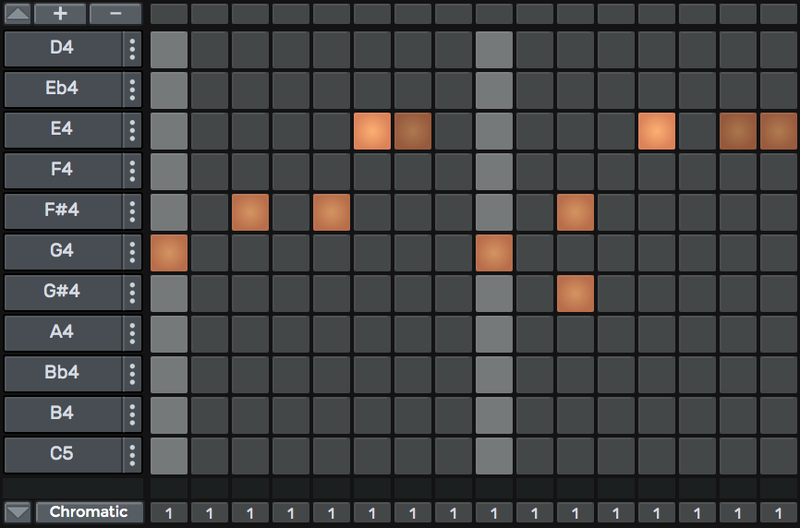 The Piano Roll window shows the MIDI events occurring in the track. The most common events are notes, but other types of events (controller commands, pitch bends, etc.) can be displayed and edited in the same way as notes. To open the piano roll just tap on this “vertical” piano icon . 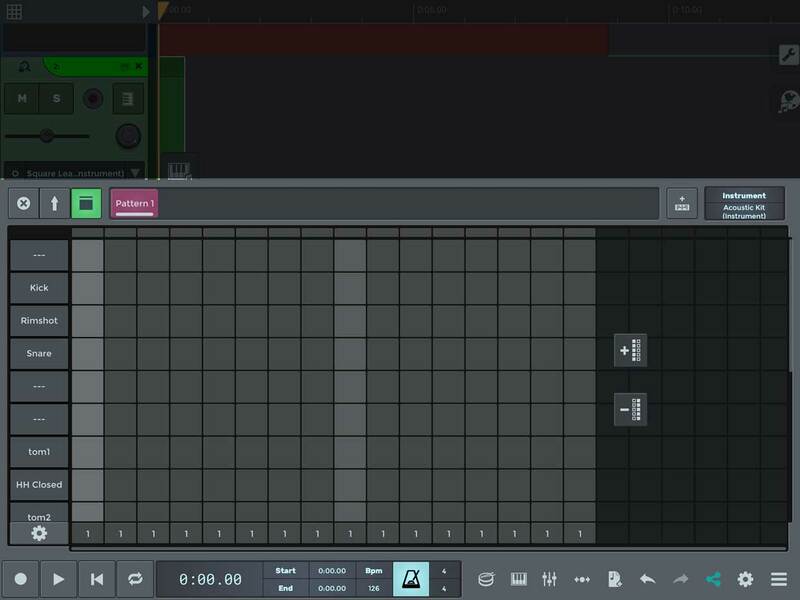 To write MIDI parts just select the “note” icon and start drawing with your finger. If you need to edit the notes in your sequence, you can use the editing widgets to move, delete notes and so on. A key part of composing MIDI, and in fact useful to make your sounds less mechanical or robotic and pheraps a little more human, is to edit the notes velocities, which represent the intensity with which the notes were pressed. 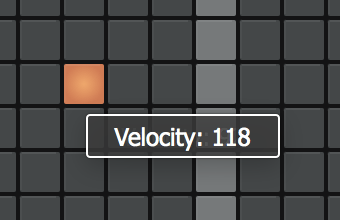 To edit velocities, you can use the area below the MIDI notes editor and draw the velocity curve you’re looking for. You can also choose to draw Pitch bend curves or curves for other controller parameters, such as the mod wheel. If your project has more than one MIDI track, then you’ll see the other tracks in this area of the piano roll. Here you can easily switch to a different track or decide to show and control more tracks in this same piano roll window. If you prefer the feel of an actual keyboard, you might prefer to play an external MIDI controller. If you’re using a more common USB connection, all you need to do is connect it to your device and n-Track should automatically recognize it. To connect a bluetooth keyboard (or bluetooth headphones), you need to first pair it to your device. You can do this in your device settings/bluetooth by selecting your keyboard. Once paired to your device, when you launch n-Track the app should detect your keyboard and ask you whether you want to use it. If you have third-party instruments you wish to use in n-Track, you’ll find these in the ‘external instruments’ tab in the instrument browser. As you'll see n-Track will automatically detect all AudioUnits, including instruments in the newest AudioUnit3 format, and made them available for immediate use. Once selected n-Track opens the instrument and the keyboard in this nice sort of splitted view, so it’s really easy to control your external audio unit without interrupting your workflow. 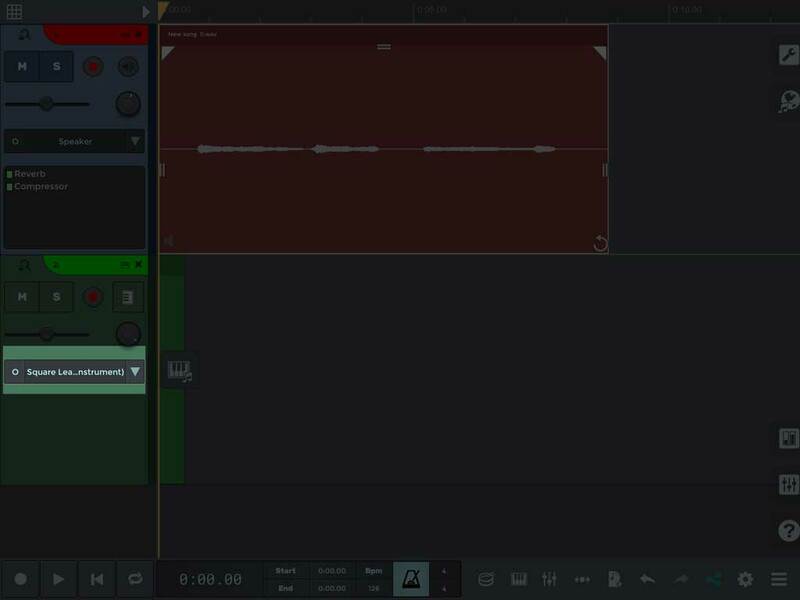 Let’s have a look at how to connect n-Track to other musical apps via Audiobus. First of all, open AudioBus. 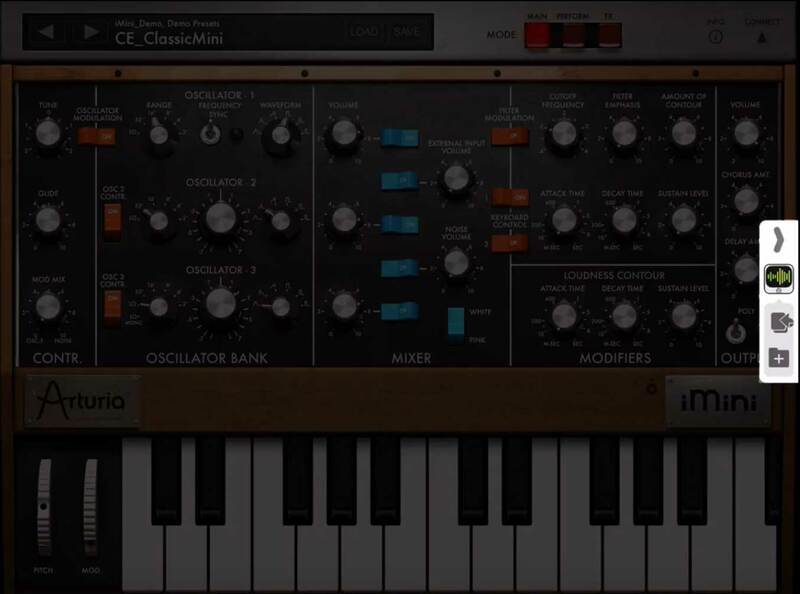 Once open, select the instrument you want to play from the ‘input’ slot and pick one, for example the iMini synth. Once audiobus loaded the instrument, tap on its icon to launch it. As you can see, apps loaded via audiobus show a little menu on the right of the screen, from which we can return to audiobus with just a click. Now load n-Track Studio in the audiobus ‘output’ slot. Now, let’s get back to n-Track. If there isn’t one, add a blank audio track, then assign the ‘iMini’, or whatever audiobus input, as the input of the track. Now let’s go back to audiobus, and open the iMini interface. As you can see, the audiobus menu on the right now shows n-Track’s transport controls. To record audio from the iMini, simply select ‘record’, then play something. By switching back to n-Track, we can see that the audio coming out of the iMini is being recorded into our newly created audio track. Please let us know if you have comments or bug-reports about n-Track Studio. We are continually working on improving n-Track and your feedback is greatly appreciated. If you're experience crashing or freezing of the app, please send us the iOS crash logs. Please click here for instructions on how to retrieve the crash logs.